Disclosure: I have no tattoos. Not one. Not even a discreet mumbling insect somewhere only cognoscenti would look. I do have some varicose veins on my legs which, if you squint, can be mistaken for tattoos. I also have a couple of holes in one earlobe, but that’s it as far as bod-mod is concerned. Only removable stuff, and not much of it. So, naturally, I’m well qualified to write about tattoos. I came up in a time when they were the sole prerogative of sailors, ex-marines, carnies, and other folk with a propensity to drunkenness in unusual places and a propensity to accept dares as solemn challenges. And, now that I think of it, a place to go when paychecks and wild urges were completely spent, until next time around the block. Themes were limited: Mom, Semper Fi, pierced hearts inscribed with ‘[your name here] Forever,’ and a handful of dragons and dripping daggers. There were prison tats, of course, but those mostly looked like some middle schoolers’ cribbed notes for an upcoming exam. They remained daring for years, until — when, the 90s? Now they’re so common it’s unusual to see bare skin younger than 60. And I mean common: pets, cartoon characters, bible verses. It’s like the middle schoolers replaced their crib sheets with the kind of doodles that used to be reserved for textbooks. Now and then you see a kanji character, an inscription in Sanskrit, or some homage to Maori body art, makes no difference which, since the bearers seldom understand them, and the artists who ink them even less often. You know those tech instructions in poorly translated, fractured English that everyone laughs at? How many tattoos in exotic scripts evoke the same kind of reaction in people who can read them? In any case, tat madness coupled with the current penchant for extremes has come to the point where it is sometimes hard to tell if someone is wearing a shirt. We’ve come a long way since Ray Bradbury’s classic book of short stories, The Illustrated Man, in which tattoos covering the entire body were used as a device to connect the stories. In 1951, when the book was published, everyone easily bought into the notion that the man was not only unusual, but possibly a dangerous freak. He wouldn’t even be considered extreme now. Are there “good” tattoos? Of course there are, dear. Only, it’s not easy to tell them from bad ones. Some people will tell you all tattoos are good by default, but that argument would be … tatological. Like all fashions, this one, too, will pass. Eventually, it will once again be a trait of the very old or very bold. One day, your kids will laugh at all the silly stuff you had permanently affixed to your body. If they can see past the folds and creases. What does it mean when someone says they are humbled by an experience? Taken literally, it would mean they are made to feel more humble, which is to say less proud. And yet, I would venture to say that most of us have never heard anyone use the expression in a context in which that makes sense, inasmuch it is almost universally used on the occasion of receiving an award. Usually, the humbling is accompanied by an expression of pride and gratitude. The higher the honor, apparently, the more humbling the experience and the greater the pride. There is only one sense in which winning an award can be a truly humbling experience, and that is if it is undeserved. Do you feel that your accomplishments are trivial compared to the work of other recipients? Was the award completely unexpected because you think of yourself as just getting the job done in a workmanlike way, nothing special? Do you feel that if the award committee looked back over your record they’d have to reconsider choosing to honor you? Is the contribution of others unfairly minimized by their exclusion? These are all perfectly normal reactions, whether valid or not. They are also utterly inconsistent with pride, and the kind of gratitude that would be appropriate in this context smacks of favoritism and ulterior motivation. If you truly feel humbled, the most honorable thing to do is to turn down the award and explain your reasons. If, after mulling things over, you decide you deserve the award after all, accept it with grace and pride, never mind the false humility. If you still feel the award is undeserved, but it would create awkwardness for the committee to turn it down, well, you’re in a fine pickle, aren’t you? It’s ironic, to say the least, that when someone actually does turn down an award, they are almost always criticized for being too full of themselves. But I can’t help it. It’s my duty as a curmudgeon to harp on these things. How will you plead at the judgment of history? If you support Trump’s attack on the constitution, you’re guilty. If you voted for Trump because you agreed with what he said, you’re guilty. If you voted for him because you wanted to shake up the status quo, you’re guilty. If you thought he wouldn’t do what he said, you’re guilty. If you cut down Clinton because you didn’t get Bernie, you’re guilty. If you voted for an incompetent third party candidate as a protest, you’re guilty. If you thought only your favorite ideology merited support, you’re guilty. If you didn’t vote at all because you thought your cool cynicism excused you, you’re guilty. If you think you’re excused from culpability because it’s all beneath you, you’re guilty. Above all, if you approve of what’s happening right now, you are guilty, and that’s how you will be judged. The king is dead! What king? In 1478 BCE, give or take a year, Hatshepsut ascended to the throne of Egypt, her recently deceased husband, the Pharaoh Thutmose II, leaving as heir only his infant son, Thutmose III. 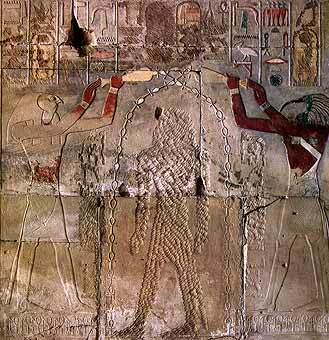 Thutmose II, the son of Thutmose I by a secondary wife, married Hatshepsut, the daughter of the same Thutmose I (bear with me here) because she was T. I’s daughter by his primary wife, and thus had a stronger claim to the royal lineage. T.II thought, apparently, that this would cement his position permanently. It worked, sort of. The only thing is, Hatshepsut was a much better leader than her husband, and when he died after a decade or so, she took control and refused to let go, even after T. III got old enough to rule on his own. I always thought of Thutmose III as being kind of like poor old Prince Charles, whose mom refuses to step down so he can be king. In any case, Hatshepsut finally kicked the bucket around 1458 BCE, having had an illustrious career as only the second female pharaoh that the Egyptian chroniclers would admit to, and Thutmose III finally got his shot. But his Aunt Hattie’s reign must have stuck in his craw, because eventually either he or his son Thutmose IV (AKA Amenhotep II; are you still with me here?) set about obliterating as much of the record of her accomplishments as he could. This was no mean task, since royal memoirs in those days were literally carved in stone. Which brings me to Donald Trump and the Republican Congress (nice transition, eh?). It will not do for a man of Trump’s boundless ego to succeed someone who, well, succeeded. So, in cahoots with the congress, which has been doing its level best to make Obama a failure, and failing at that, Trump will try to see to it that any vestige of Obama’s success be obliterated. The process has already started with an executive order cancelling unspecified parts of the health care act, and will soon continue with more executive orders. We well might ask how effective this kind of exercise is. Did it work in ancient Egypt? Ironically, two and a half millennia later, Hatshepsut is not only remembered, but honored as one of the most effective pharaohs Egypt had. I suspect Obama’s reputation will be restored much sooner than that. His accomplishments may not be carved in stone, but I predict it won’t be long before people start pining for the good old days when he was in charge.